BuySoundtrax Records is pleased to announce the release of SOMEWHERE IN TIME: THE FILM MUSIC OF JOHN BARRY, a compilation of newly produced recordings celebrating the work of one of the modern giants of film music, a composer of diversity and distinction whose elegant melodies were able to capture the heart of an audience as profoundly as his electrifying action music captured their attention throughout a career that spanned almost half a century. 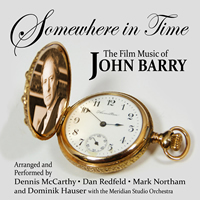 SOMEWHERE IN TIME: THE FILM MUSIC OF JOHN BARRY takes some of Barry’s most stimulating melodies, a couple of his earlier tracks, and a few lesser known pieces, arranged and interpreted for solo piano, live orchestra, and high-quality digital orchestra mixed with live strings, winds, and brass, in each case exploring the gentler touch of John Barry’s magnificent film music. 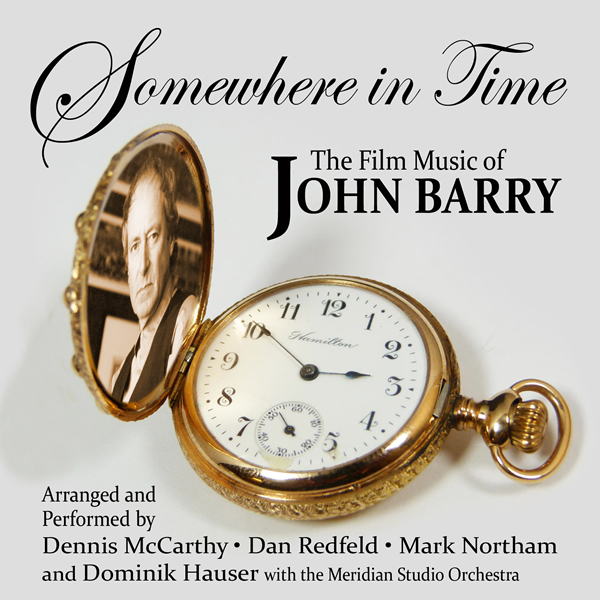 SOMEWHERE IN TIME: THE FILM MUSIC OF JOHN BARRY includes music from OUT OF AFRICA, THE IPCRESS FILE, DANCES WITH WOLVES, MIDNIGHT COWBOY, INSIDE MOVES, HIGH ROAD TO CHINA, JAGGED EDGE, THE SPECIALIST, BODY HEAT, RAISE THE TITANIC, HOWARD THE DUCK, THE DEEP, KING KONG and SOMEWHERE IN TIME in newly produced recordings arranged and performed by Dennis McCarthy, Dan Redfeld, Mark Northam and Dominik Hauser with the Meridian Studio Ensemble. Dennis McCarthy’s roots in the music business began as arranger/orchestrator for Glen Campbell and composer Alex North. He was also musical director for THE BARBARA MANDRELL SHOW. In addition to his work on television series such as V and STAR TREK, he has written music for MANCUSO, FBI, LIFE STORIES, MACGYVER, PARKER LEWIS CAN’T LOSE, TINY TOONS, STARGATE SG-1 and PROJECT: GREENLIGHT. He has also written music for television movies such as GONE TO TEXAS, SWORN TO SILENCE, LEONA HELMSLEY: THE QUEEN OF MEAN, DADDY, Danielle Steele’s KALEIDOSCOPE, OVERKILL and BREAST MEN for HBO. He has scored feature films such as McHALE’S NAVY, THE UTILIZER, DIE, MOMMY, DIE and CRIMSON HIGHWAY. In addition, Dennis has composed music for THE STAR TREK EXPERIENCE in Las Vegas as well as music for the STAR TREK: BORG video game. Originally from Switzerland, Dominik Hauser received his education at the Jazz School St. Gallen in Switzerland, earning a masters degree in music. In 1996 Hauser relocated to Los Angeles, to attend UCLA where he delved deeply into film scoring. Subsequently he took his skills to the realm of indie cinema and began composing for film. Hauser’s work involves him in a variety of projects, including cinema, theater and video games. Recently Hauser completed arranging and orchestration on the restoration of the first Best Picture Academy Award® winner WINGS for the 2012 Paramount Picture centennial celebration. His work for the record label BSX includes THE BOUNTY, SCROOGE and THE STRANGE CASE OF DR. JEKYLL AND MR. HYDE. Hauser recently published his fourth book, SOLOING FOR BASS. SOMEWHERE IN TIME: THE FILM MUSIC OF JOHN BARRY celebrates the legacy of the composer best known for his work on the James Bond franchise and a career that includes more than a hundred other films, producing some of the finest film and television scores of the medium’s history. He was a master of interactive, thematic action scoring, of turning a tune as comfortably in jazz, pop, or rock, who could electrify a chase scene, heat up a sultry summer night, and create dramatic tension by the simple turn of a musical phrase or a change of key. Above it all, however, Barry was an intuitive melodist whose gentle, lyrical, unforgettable romantic themes could speak right to the heart of the listener, be it man or woman. John Barry received multiple Oscar and Golden Globe nominations during his career winning the Academy Award four times and one Golden Globe. SOMEWHERE IN TIME: THE FILM MUSIC OF JOHN BARRY includes liner notes written by author Randall Larson providing insight into the history of the music and the composer. SOMEWHERE IN TIME: THE FILM MUSIC OF JOHN BARRY is a limited edition release and is now available from www.buysoundtrax.com.